So far Chad Everaert has created 10 blog entries. LiquiForce has successfully implemented a comprehensive health and safety management system to a standard worthy of COR certification from the Infrastructure Health & Safety Association (IHSA), the authority for COR in Ontario, as recognized by the Canadian Federation of Construction Safety Associations (CFCSA).During the audit process, numerous strengths were identified within Liqui-Force’s management system. During the audit process, numerous strengths were identified within Liqui-Force’s management system. Liqui-Force’s Management commitment and corporate safety culture is second to none. It is evident that senior management has fully embraced the top down management approach with regards to health and safety management. Employees are fully engaged, and the resources required to develop, implement and maintain a sustainable Health and safety management system see no boundaries. The President of Liqui-Force is highly involved and engaged in all aspects of the Health and Safety Management system, which is echoed by employees throughout the company. To achieve certification through the IHSA takes dedication and commitment, which Liqui-Force has proven. and deficiencies. These software programs prompt the assignment of responsibility and measures to hold responsible parties accountable. Liqui-Force utilizes the eCompliance HSMS Software to record, track and analyze statistics for trends, tendencies and patterns with respect to health and safety performance. Liqui-Force also catalogues both leading and lagging indicators monthly and implement the Pareto Principle to monitor cause and effect of incidents and occurrences. It is evident that key personnel of Liqui-Force understand the importance of statistics as they allow a company to learn from their mistakes and proactively implement CAPA through the analysis of near misses, trends and consistencies. On June 22nd, over one hundred and sixty water professionals came together to celebrate innovators and influencers in the water sector at the Water’s Next Awards Gala—part of the 8th annual Canadian Water Summit. LiquiForce was the proud recipient of the Conveyance award in the Project/Technology Division. Do you really need a cleanout? With the Gravity Program from LiquiForce there is no need to install cleanouts to line existing laterals. This results in a cost and time savings that facilitates the rehabilitation of more laterals in a shorter period of time. 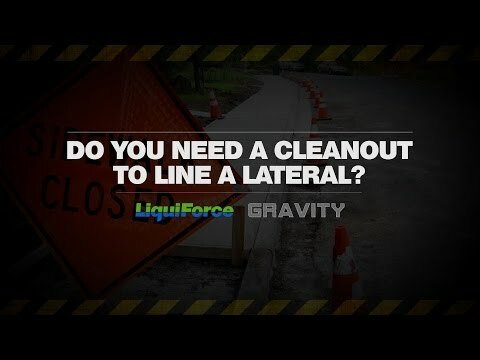 So do you really need a cleanout to line a lateral? We don’t think so. The choice is yours. The Gravity Program was featured in the May/June issue of Canadian Underground Infrastructure magazine. Read how the program is helping solve root intrusion in Windsor, Ontario.